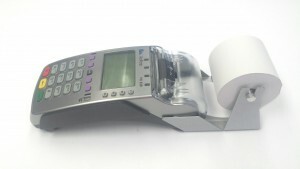 Verifone VX520 EMV Terminal with Paper Adapter and 2 1/4" x165' Thermal rolls. Verifone VX520 with Smart Card generates new recurring revenues from value-added. Verifone VX520 with Smart Card generates new recurring revenues from value-added applications, thanks to an extraordinary increase in memory of 160 MB standard, increasing to over 500 MB. Takes advantage of the industry’s fastest processor to handle encryption, decryption and processing at lightning speeds — moving more transactions in the same time for greater profits.Offers a full range of connectivity options with choice of dial, dial and Ethernet, or dial, Ethernet AND smart card configuration. THE PHOTOS ARE STOCK PHOTOS. THIS TERMINAL IS EMV ONLY NOT CONTACTLESS. Contents: Vx520 EMV Terminal, Paper Adapter and 1 case 2 1/4 x 165 - 30 thermal rolls.